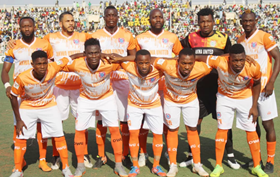 Akwa United star Ndifreke Effiong has played down concerns over an injury he sustained in his side's 2-1 win against Heartland FC in Okigwe on Sunday, March 18. The versatile fullback, who was forced off injured in the early stages of the second half in the Nigeria Professional Football League clash, claims he has been cleared by doctors to report for international duty. Effiong was handed a late call-up by manager Gernot Rohr and the Nigeria Football Federation as replacement for Chelsea loanee Ola Aina who pulled out of the squad, citing injury. ''I am coming to camp tomorrow (Tuesday). I had a little shock in my knee, that's why I was substituted, it's not serious,'' said Ndifreke Effiong to allnigeriasoccer.com. Five members of the Dream Team VI squad that won bronze at the 2016 Olympic Games have been named to the latest Super Eagles roster. They are Ndifreke Effiong, Daniel Akpeyi, Troost-Ekong, Shehu Abdullahi and Oghenekaro Etebo.